Inspired by the art deco architecture of the late 1920’s and 1930’s, these popcorn machines are ideal for home theaters. Its unique design enables it to be placed against a wall for a minimal space requirement while still providing an attractive visual impact. 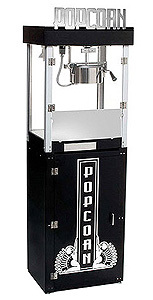 Ordinary popcorn machines have the graphics and cosmetic appeal on the back of the popper making them unsuitable for wall placement. 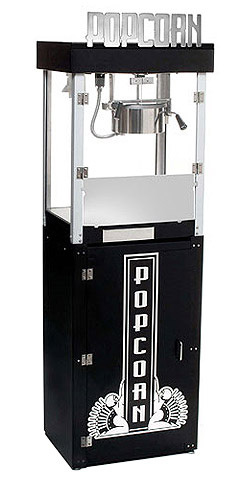 The optional pedestal base provides storage for all of your popcorn supplies while placing the popper at the ideal operating height. 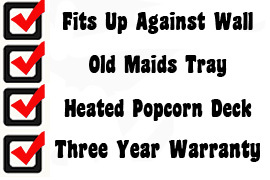 These commercial quality poppers feature a aluminum food-zone, 20 mil anodized kettle (for easy cleaning), a heated warming deck to keep the popped corn fresh for hours, old-maid drawer (for un-popped kernels), tempered glass panels and a three year parts warranty.